If you're walking down 10th Street in downtown Minneapolis and you see some crazy people yelling out of a doorway, or perhaps you peek in the windows and see them yelling at each other while a bunch of people are sitting on chairs watching, don't be alarmed. It's just theater. I wouldn't blame you for not recognizing it as such - it's not like the theater you probably are familiar with. It's raw, real, and intimate, happening all around you in three separate locations in the space as the audience moves around to follow it. It really feels like eavesdropping on a conversation, which can be awkward because these are very intense, personal, heavy conversations! But it makes for some pretty amazing, unique theater. 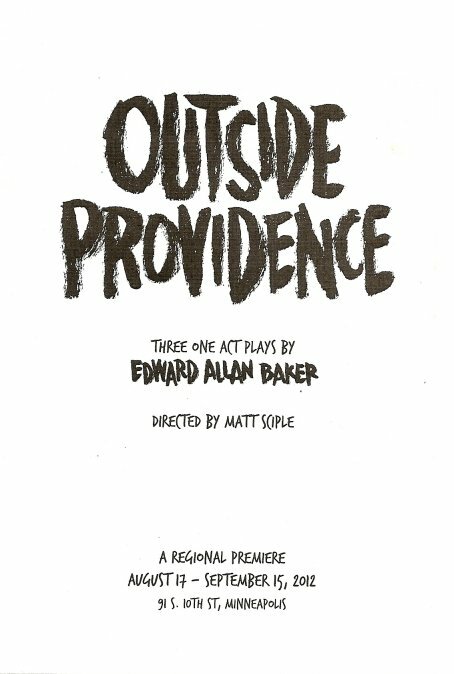 Outside Providence* is comprised of three one-act plays by Edward Allan Baker. They are not related in terms of the same characters or storyline, but they are most definitely all connected in theme. All three deal with relationships (sisters, a married couple) among working-class people in Providence, Rhode Island (for those of you who, like me, know nothing about Rhode Island except that it's the smallest state, think South Boston). These people do not have easy lives or relationships. In Rosemary with Ginger, two sisters meet in their old neighborhood to enter their mother in a contest, bringing up issues of their past and present. Face Divided features a wife who loses herself in her small, closed-in life while her husband is off working and playing in a band (kind of like a poor, modern-day Betty Draper). Dolores again features two sisters, each with troubles of her own. These are desperate people who do desperate things, but continue to love and support each other. A note from the playwright explains it best: "A good dramatist puts misery on its feet and makes it entertaining, engaging an audience's interest so as to evoke empathy for those members of our species who are trapped - especially women." 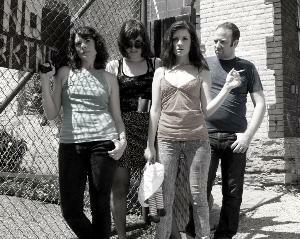 Four actors (Catherine Johnson Justice, Alayne Hopkins, Sara Marsh, and Ryan Lindberg) portray these complicated characters, and each gives an amazingly open, truthful, raw performance. In the fully-lit room, the actors are so close you can see the look in their eyes, and all you can see there is the desperation, hope, and everything in between that the character is feeling. It's pretty powerful stuff. The space is interesting and unique - an office on 10th Street in Minneapolis with windows looking out to the street where you can see passersby curiously looking in, adding to the feeling that this is happening right here in the real world, not on some distant stage. 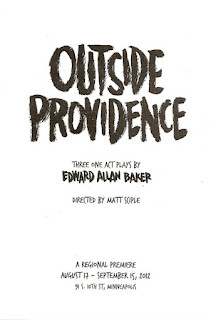 *I received one complementary ticket to Outside Providence. hi esther, that's so cool! thanks for the tip, as a lifelong midwesterner all i know about the east coast is what i learn from tv/movies/theater (which is really where i learn about most things ;). have you ever seen any edward allan baker plays? you should definitely check him out if you get the chance.